What Do You Mean By Being Saved? Have you received Christ into your heart? IN A MILLION YEARS WHERE WILL YOU BE? WHERE WILL YOU BE A MILLION YEARS FROM NOW? WILL YOU BE HAPPY? WILL YOU BE SINGING? WHILE AGES ROLL THROUGHOUT ETERNITY. I ASK THIS QUESTION, WHERE WILL YOU BE? WILL HE SAY WELL DONE? A MILLION YEARS FROM NOW? Life begins at birth, so too, as the first birth brings life. When you are born the second time, a new life begins in you. Christ in you! (Gal. 2:20) The second birth is just as real as the first. You are alive with Christ life in you. God always uses a woman’s anatomy, the womb, when describing salvation in the Scripture. Salvation always comes through birth, a new birth. As it takes the male and female to bring about the first birth, so the second birth comes through a union of the Word of God with the Holy Spirit, in you. No one, absolutely no one, can be saved apart from the Word of God! 1Peter 1:23 You must come to God in faith believing, believing the Word of God! (Heb. 11:6) He then, immediately floods your heart with His Spirit. (Titus 3:5) Never is it by some act of man. No matter, how good you are. You can be the best person in the world and still go to Hell. "Good morals will keep you out of jail but not out of Hell." It’s by a new birth! It’s not by the words one prays. Prayer is essential for a right relationship but not for salvation. It’s not even through baptism. How can baptism save anyone? A person hast to be born first, and then comes baptism. Can you command your child to do something before he is born, certainly not. Only through the new birth are you saved! "You must be born again"! Now, here is how you are born again. Realizing you are wrong and He is right, Repentance. You must know, realize that God loves you? Our sins have separated us from God. " For all have sinned and come short of the glory of God." (Rom. 3:23) God made man in His own image. He gave man the ability to choose right from wrong. We choose to sin. Our sin keeps us from God. Conviction of sin a must! "For the wages of sin is death..." (Rom. 6:23) Wages means payment. 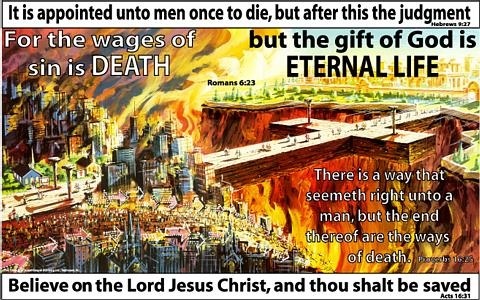 The payment of our sin is death and Hell, separation from God forever. If we continue in our sin, we shall die without Christ, and be without God forever. " The Good News is that Christ paid for our sin. All our sin was laid on Christ at the Cross. Pray and receive Christ as your Savoir. Try it! It works! He'll save you! If you have prayed and ask Christ to save you, please write or email us and let us know, we will be delighted to send you some information to help you grow in your new found relationship with Jesus Christ. We also would like to help find a good Bible believing Baptist church near you to attend that growth may follow. God created the human race without any faults or weaknesses. Adam and Eve, the first human beings, were perfect and complete. They were good and desired to do what was right because the very essence of goodness lived in them. They had no trace of bad or evil in them. In fact, the Bible says, after God created human beings, He himself said that his creation was good. Goodness gave life and direction to people. Why are we no longer the way God created us to be? From the time of Adam, an enemy, Satan, has sought to destroy what God made. Satan tempted Adam and Eve to disobey God, and they fell to his temptation. When people disobeyed God, two things happened. First, evil entered them. Since that time, every person has had to struggle with evil or bad living inside of him. This bad nature was not part of God’s original plan for his creation. Second, the good in people died when they disobeyed God. We understand what goodness is, but goodness has no life of its own. In fact, we have to put all our energy into doing good and keeping bad from coming from us. When we are tired or someone offends us the bad in us takes over the good. The good requires our effort to make it happen. For example, a husband understands how he is to act around his wife. He knows he should love her and treat her well. Yet he fails to do the good he knows he should do. Likewise, parents try to be sensitive and understanding with their children, but their bad side seems to come out as they relate to each other. Even children do not need to learn to be bad. We can constantly correct them and teach them to be good. Despite our best efforts, they still do wrong things and seem to be slow in learning to be good. What can you and I do to gain control of the bad in our lives? How can we bring life back to the good that is in us? People suggest various ways to revive the good in our lives. Some say the key is knowledge. The more we instruct people, the more they will change for the better. But instead people use their knowledge and intelligence to get their own way or to manipulate people. Knowledge doesn’t bring life to the good. Others say discipline is the key. If we are more disciplined in our lives—in our thoughts, habits, exercise, and so forth—we will improve and do more good. Yet people closest to us know what kind of people we really are. Through discipline we might create a world in our minds, but we still live in this world. All too often exercise seems ineffective in bringing life to the good. Religion is another option. Perhaps if we go to church, a mosque, or a synagogue, or if adopt a new religious perspective, then we will become better people. Unfortunately, what we usually gain from religion is another outlook on the world that will grow old, not the start of a new life within us. Finally, some say, the law is the best choice for attaining good. If we have legislation that can regulate our behavior, particularly our moral behavior, then we will be better citizens and people. Yet more rules lead to oppression rather than to a desire to do right. Our human nature seeks to get around laws by finding exceptions for our behavior and justifying our actions. The law doesn’t bring goodness to life within us. Knowledge, discipline, religion, and the law can add much to our lives. All of these solutions try to curb bad behavior, but they will never revive the good in us. They are only influences from the outside. When we stop concentrating on controlling the bad within us, we succumb to its influences again. Should we just be pleased with our attempts of being good some of the time? Because it is so difficult to be good all the time, many people conclude that it is an impossible goal. They say we can only do many good deeds to make up for our bad deeds. It is as though our actions are placed on a scale. Our job is to make sure the good in our lives outweighs the bad. Life, then, becomes a test to see if we can do more good than bad. God has created us for a purpose, not to test us. The Bible says he created us for good works. God made us to do good, not to test us to see if we would do more good than bad. True life is living a fully good life as God created us to have it. But the good must first come to life. Rather than being like a set of scales, our lives are like a full glass. The glass is filled to the top with all the good works God desires us to do. When we do a good deed—the best good possible—we add nothing to the glass because we are only doing our duty, what God purposed for us to do. More often, though, we take from my glass and so fall short of God’s purposes for our lives. This happens when we do a bad deed or pass by an opportunity to do a good work. It also happens when we do a good work only because it serves our ends or desires. For example, we can be kind to my spouse because we want to ask for something later. In these ways, we miss God’s plan for us to be truly good. Throughout our lives, we take from the glass and end up short of the good life God intended for us to have. Our only hope to become a truly good person lies in God, the one who created us. How will God help us? What has he done to control the bad and give life to the good? God has the power to recreate all the people in the world without evil. Instead of doing this, he respected and preserved his creation. He chose to use his power in another way to intervene in our lives. He would destroy the hold Satan has over people, and he would give us a new life so goodness can live again in us. The battlefield between God and Satan is the world God created. God sent Jesus Christ into this world to confront Satan and his works. Satan threw all his tricks at Jesus Christ. Jesus was misunderstood and tortured by corrupt men. His reputation was destroyed by lies. Finally, Satan used an unjust government to kill Jesus for crimes he did not commit. Jesus Christ willingly took on all this evil, but it never defeated him. He never once responded to evil with evil. He overcame evil with good. To defeat Satan, Jesus deliberately experienced death, the ultimate weapon and evil of Satan, and overcame it. By coming back to life, Jesus showed that he was more powerful than the greatest evil at Satan’s disposal. Jesus Christ is the only person who has ever lived who conquered evil and death. Jesus the Lord showed that he was greater than Satan. Jesus broke the powerful hold Satan has and has the power to give us life. He alone can make the good within us live again. How does Jesus share his power over evil with us? There was once a man who boasted that he was stronger than the prison and all the prison guards. Hearing of these boasts, the prison guards went to capture the man. But the man disappeared. Was he stronger than the prison guards or not? A second man boasted that he was stronger than the prison and the prison guards. When the guards came for him, he came out and met them. They captured him, beat him severely, bound him, and then took him past all the prison cells to the farthest dungeon. There they locked him in, leaving guards at the door. The superintendent of the prison sat in his office with his buddies laughing at the man and his boasts. But they did not laugh long. Soon they heard sounds from within the prison. The man had torn off his chains, pushed open the door, thrown aside the guards, and opened all the other prison cells one by one, calling, "Anyone who wants to leave this prison, follow me!" Some of the prisoners were afraid. If they joined this man now and he was captured, they along with him would suffer even worse torture than before. But others said, "Look, they’ve already done to him the worst they can do, and he has shown that he is stronger than them. I’m following him out!" Those who followed him closely all the way out of the prison found that he shared with them his power to open cell doors and defeat the guards on the way. Eventually, they followed him all the way to his Kingdom of Righteousness. Jesus Christ has promised to revive the good in every person who believes him and accepts him into his or her life. He is the prisoner who was beaten and yet escaped from the prison of evil. He calls us to follow him into a new life of goodness. What happens when we follow the Lord Jesus Christ? When Jesus makes the good in us alive, we are free to make right choices. We have a desire to do good deeds that comes from the inside rather than just from the outside. We have new strength to do good. The Bible says we become completely new people. God is the source of our new life. We still have a problem. The old, bad part of us continues to live within us. In heaven, God promises to remove the bad in us and restore us to the same condition as when he originally created us. Until then, we will have a struggle inside between the good and the bad. We also face external pressures to compromise. The world in which we live is not neutral. Circumstances or other people try to influence us to compromise. For example, our coworkers may not want us to tell the boss that they are cheating on their time or taking things from work. They want us to do the same so we won’t tell on them. Satan also opposes our new life. He wants to destroy us and will try to deceive us with lies. How has God given us help for this struggle? God has not left us to fend for ourselves. Not only has God revived the good in us through Jesus Christ, but also he has more than adequately provided for us to live this new life. God has given us three very important elements to provide us with a full and meaningful new life: the Bible, his Holy Spirit, and a new community called the church. The Bible is our guideline for living. It will counter the lies of Satan. In it we find not only God’s law, which now is our delight and desire to follow, but also God’s perspective on life and this world. The Bible is the Word of God, and it guides us in understanding the will of God. Without it we will lose perspective. Since we are not neutral, we need God’s Word to influence our thoughts. The Holy Spirit is God’s Spirit who lives in us when we receive new life from Jesus Christ. He tells the person who is alive in Christ what thoughts and actions are contrary to God’s way. It is God who lives in this person, so he doesn’t have to be afraid of Satan and his demons. When the person listens to the inner voice of the Holy Spirit, he will make right decisions and will be able to follow the will of God. The church is the community of God’s people. We belong to a new family, the family of God. This community of believers serves several purposes. The church models the new life in Christ. It also gives us examples of people who follow the Holy Spirit, even in situations where there might be a high price to pay for obedience. These examples are positive role models for the new person in Christ. The church provides encouragement and direction to live this new life as we struggle through life’s perilous path. If any of these three ingredients is missing, a person who is new in Christ may fall into traps laid by Satan. It will be impossible to resist the bad in this world without the help God has given us in the Bible, the Holy Spirit, and the church. Does new life in Christ prepare us for the judgment day? We often think that God will judge us according to the good or the bad we have done. However, what we do is a reflection of what lives in us. God will judge us according to whether or not we have new life from him. If we have this new life, God will remove the bad in us when judgment day comes. We will be as God originally created us to be, and he will bring us into heaven. If we do not have this new life from God, then the understanding we have of good will be removed, and we will be sent to hell, a place intended for Satan and his demons. Do you have this new life in Christ? Do you want to be a truly good person? More religion, knowledge, discipline, or laws will not give new life to a person. Satan’s power needs to be broken, and a new life must enter into you. No prophet, guru, religion, or holy man can give you this new life or adequately protect you from Satan and his evil works. The key to living a truly good life lies in what Jesus the Saviour has done for you. He led a perfect life. He allowed the power of evil to destroy him and overcame its power by coming to life again. Now Jesus Christ wants to give life to everyone who asks him for it. The Bible says, "But as many as received Him, to them gave He the power to become the sons of God." (John 1:12) All you need to do is to ask him for new life and trust him to give it to you. All those who believe him are reborn and become his children! The shame of our past life is removed as we are brought into God’s new family. Click This lighthouse will show you the way home. Just Get On the Ark! Noah and his family were saved from the flood by getting on the ark, period. The ark is a symbol of salvation. They didn't have to amend their ways, promise to do better in the future, give up the world, make a commitment to Christ nor reform. 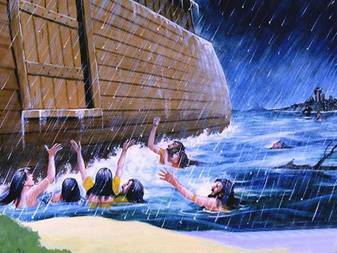 No, they simply got on the ark before the door was shut and the rains began to fall. This is the simplicity of salvation which is in Christ Jesus. So many religious scholars and pastors make salvation hard, but it's as simple as getting on the ark. Jesus has paid for our ticket to Heaven with His own literal blood. A person simply needs to acknowledge their guilt of sin and believe on Jesus as the Savior for forgiveness. Salvation is as simple as getting on the ark. Please feel free to help yourself with our free literature! Either online or we would be glad to mail!